Dr. Larry Lynd received his BSP in 1986 from the University of Saskatchewan and his PhD in the UBC Department of Health Care and Epidemiology in 2002. He then completed a two-year post-doctoral fellowship in health economics with Dr. Bernie O’Brien at McMaster University. Dr. Lynd is a professor and director of the Collaboration for Outcomes Research and Evaluation at the UBC Faculty of Pharmaceutical Sciences, scientist at the Centre for Clinical Epidemiology and Evaluation, scientist at the Centre for Health Evaluation and Outcomes Sciences, and scholar at the Peter Wall Institute of Advanced Studies. 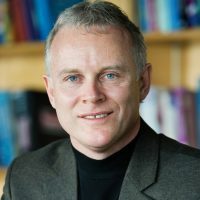 Dr. Lynd has made significant contributions serving on a number of committees, including chair of the Health Canada Special Advisory Committee on Non-Prescription Drugs, Special Advisory Committee to the Respiratory and Allergy Therapies Division of Health Canada, BC Ministry of Health Services Expensive Drugs for Rare Diseases Committee, and the BC PharmaNet Data Stewardship Committee.